Supergirl as she appeared in Superman: The Animated Series! 6-inch resin bust includes a certificate of authenticity and a full-color box. While she may not truly be Superman's cousin, Kara In-Ze hails from same region of space, making her strong, fast, and tough under Earth's yellow sun. So, think twice before committing a crime within the Metropolis city limits! 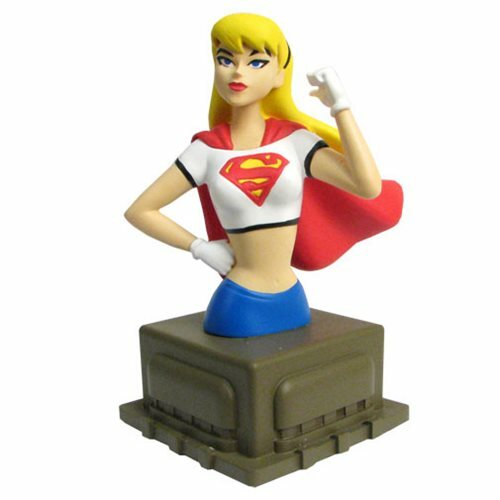 This Superman Animated Series Supergirl Bust measures approximately 6-inches tall in resin. It depicts Supergirl as she appeared in Superman: The Animated Series, striking a confident pose on an architectural base. She comes with a certificate of authenticity in a full-color box. Ages 13 and up.